LOS ANGELES — Brandon Crawford, as indispensable as any Giant, was pulled between innings Tuesday night after dislocating his left pinky finger. Crawford tried to go first-to-third on a single to left in the second inning and he was thrown out by Andrew Toles. 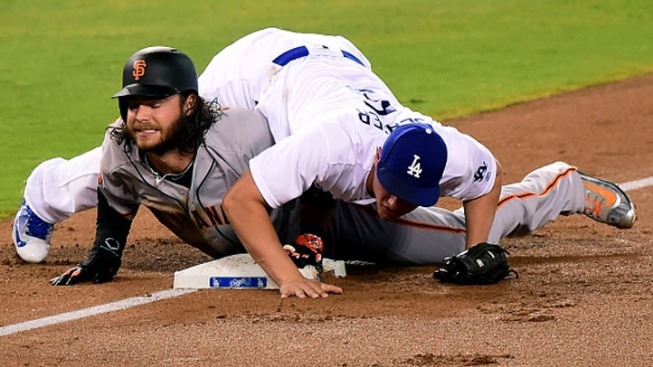 Crawford went hard into third base with both hands and Corey Seager fell on his back after applying the tag. Crawford immediately reached for the finger with his good hand, and he stayed down as players ran off the field. He clasped both hands together in front of his stomach as he walked back to the dugout. Trainer Dave Groeschner immediately took Crawford back to the clubhouse and coaches ran over to get Joe Panik into the game. Panik took over at second, with Ehire Adrianza shifting from second to third. Crawford missed a couple of days in 2013 after spraining two fingers on his right hand. A loss of their shortstop for any amount of time would be a devastating blow to the Giants, a team just barely hanging on to a wild card spot. Crawford seems a lock to win his second consecutive Gold Glove Award and he ranks eighth in the league in Wins Above Replacement (4.8). Crawford is batting .268 with 12 homers and 80 RBI.